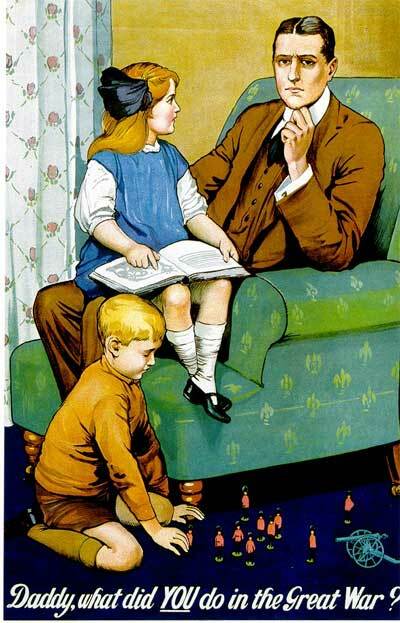 Observations on what Daddy does in wartime: The young girl sitting on her father's lap asks a very important question, the answer to which seems to be troubling her father. This is a British recruiting poster from WW1 which was designed to inspire guilt in those men who had not yet volunteered to enlist to fight against the "Hun". The poster asks the male viewer (probably not married and without children) to imagine life after the war when his future children will no doubt ask him this very pertinent question. She has been reading what seems to be a history book about the "Great War" with diagrams of fortifications or trenches and, with her finger carefully placed on a specific picture, wants her father to explain exactly what he did and where he did it. The father (who hadn't enlisted) can't answer her question. Would the young adult male viewer of this poster want to be in the same difficult situation a few years hence? Note the young son is happily playing with (probaly lead) toy soldiers who are wearing the British scarlet jackets. Also note the very prominently placed over-sized 19th century artillery piece in the bottom right. The boy would have been of military age when war broke out again in 1939. 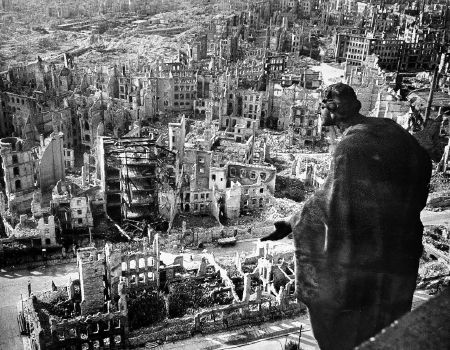 If the boy had joined the Royal Air Force he might well have participated in the "carpet bombing" or "fire bombing" of German cities like Dresden in the closing months of WW2. In these attacks there were at least two waves of bombers: the first with standard bombs designed to break apart buildings and other infrastructure such as gas and water mains; a second wave of bombers would fly over with incendiary bombs designed to set fire to the rubble created by the first wave. A fire storm lasting most of the night would ensue, killing tens of thousands of people, mostly by asphyxiation (read Kurt Vonnegut on this topic). 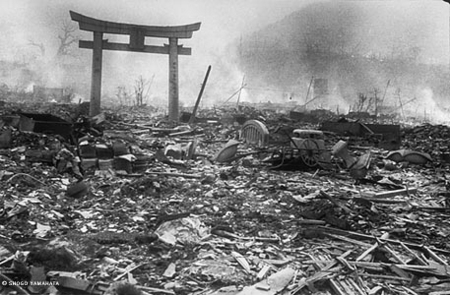 The second photograph was taken by the Japanese photographer Yōsuke Yamahata the day after the atomic bombing of Nagasaki. Insread of requiring a thousand or more British and American bombers to set fire to German cities, one American plane with one atomic bomb could cause the same devastation to a Japanese city. British and American fathers who had served in the air force could tell their children in the 1950s eactly what they had done in the last "great war". The two photos also share a common theme of religion: the photo of Dresden was taken from the top of the cathedral from which we have the same perspective as the statue of the saint in the foreground; one of the few structures left standing in Nagasaki appears to be the gate of a temple which is at roughly eye level, but it leads nowhere.